VOB is known as the DVD Video format to store videos in the DVD. This format is used for the DVD only and it stores the audio, video and subtitles in a VIDEO_TS folder in the DVD. If you have downloaded lot of videos from the online video sites then there is a solution for this that you first convert FLV to the VOB format then you can store those videos in a DVD. In this tutorial we will learn about how to convert FLV to VOB format. KeepVid Video Converter is the tool what you need to convert FLV to VOB format to burn the FLV to DVD. This FLV to VOB converter tool will convert the FLV to VOB or any other format of your choice in just 3 steps. This is a very easy to use software with a very easy to use interface which can used by anyone even if you have don’t have any technical knowledge. With this converter tool you get the wide range of features which can make your life very easier. Supports wide range of video and audio formats. There are 1000+ formats supported by this program in number. Convert the videos by 30x faster speed with few clicks in an easy way. Download the online videos from nearly about 10000+ sites with just one click. Merge the system videos together to make a big video. Crop, trim or add special effects to your videos before conversion with this tool. Step 2. Select VOB as an output, and click the Convert button to start converting FLV to VOB. Download FLV to VOB converter free full version on your Mac or Windows system and install it. Once installed click to “Add files” option and then choose the FLV from the local drive or you can also drag and drop files to convert. Click to the Inverted triangle button in top right side and then click “Video” tab. Choose VOB as your target format. Finally press “Convert All” button and FLV to VOB converter free full version tool will convert the files in your needed format in few seconds. •	As we already told you that VOB is known as DVD video format so never get confused about the formats. You have to convert files in VOB format only to play on DVD player. •	It can also convert the videos in the devices formats directly by choosing the format according to device name. •	If you are facing lack of subtitles in the video file then you can download subtitles from internet and add them to video before conversion using this converter software. 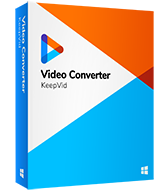 KeepVid Online Video Converter is an online website where you can get your files converted in the other formats without any installation. This is FLV to VOB converter free full version website because it is totally free and you don’t need to spend anything to convert files with this converter. The other thing is that it is online website so there is no need to install software on your system and do any registration on the website. This converter website can also convert the files in devices format by choosing the format with device name. AConvert is a free convert website which is less popular among people but it is very useful as it supports many types of file conversion for free without any charge. This website enables you to convert videos, audios, documents, pdf, images, EBooks, webpage and archives from one format to another. 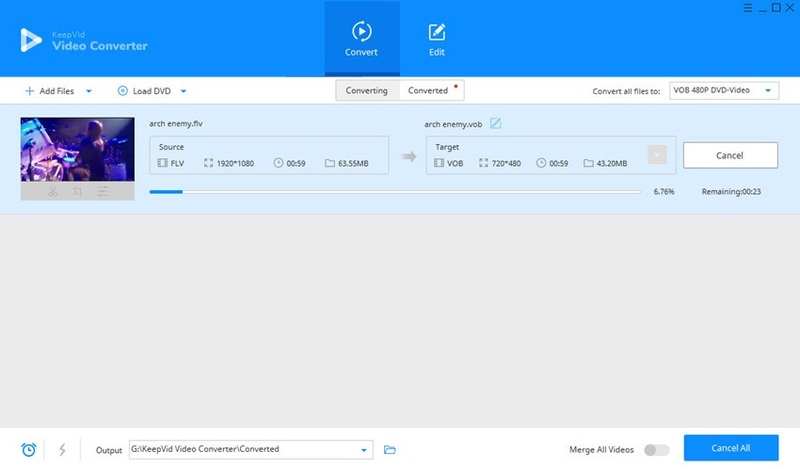 You can also cut, merge, crop or rotate the videos with this online converter. URL conversion is also supported by this converter so you can easily convert videos by entering the URL of desired video. https://www.aimersoft.com/video-converter-ultimate.html Video Converter Ultimate is a development of Aimersoft website officially and this software is available on different software sites to download for free of cost. There is only trial version available to test the software because this is not a FLV to VOB converter free full version software. This program is compatible with windows (up to widows 8) and Mac OS. 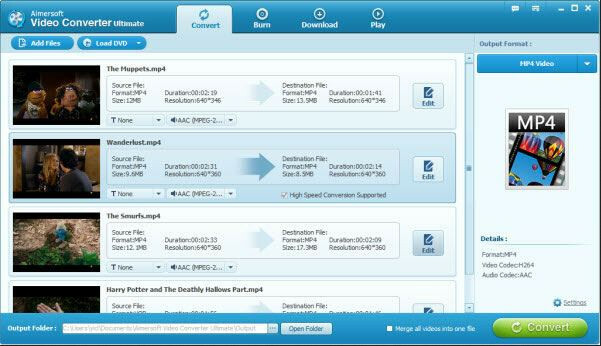 Convert audio video files in 1000+ formats quickly. It enables you to remove DRM protection from videos. You can create DVD’s with menu. Total video Converter is a very old converter program available over internet. This converter software is an innovative full HD converter enables you to convert your files in the HD quality outputs in high speed. This converter program enables you to convert the video and audio in mostly all popular audio video formats. If you don’t want to store the videos in DVD then you can also extract audio from the videos using this converter. Powerful converter program enables you to convert FLV to VOB very quickly. Supports all popular formats for file conversion. Combine multiple videos together for making a single file.